Leadership and management experiences from the manufacturing world. 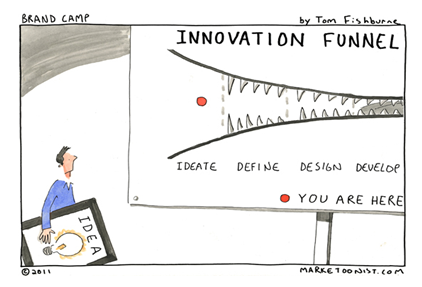 Idea Management Software: Filtering ideas to find the best ones is not the most valuable feature. Before the advent of the web, and more specifically, Web 2.0 technologies, effective innovation was a slow process and was usually limited to large organizations which had the resources to genuinely filter through thousands of ideas. One of the best examples of idea management connecting the idea funnel to the idea pipeline is that of Disney. According to Peter Schneider, who was president of Disney features, many of Disney’s best ideas came from their home-grown “Gong Show”. Several times a year employees had an opportunity to pitch their ideas to Eisner (Disney’s CEO) and several other top managers. Up to 40 of them would perform or present their ideas until a ‘gong’ would sound. Eisner and his team would then discuss each one and decide which ones would fit strategically with their vision. Disney Stores, as well as many of their animated features were born through this process. Eisner and the Disney team clearly understood the value of listening to their employees and applying strategic criteria to each idea, however, in the face of this process, and the fact that top management had to sit, sift and decide based on input from 40 employees, this process was highly inefficient and ineffective. For one, most employees would faint at the thought of standing directly in front of Eisner to pitch their idea, so only the bravest would stand a chance at presenting their idea. Second, of these 40 probably came through some resource intensive pre-vetting otherwise Eisner et al (and their expensive salaries) probably would have had to listen to some pretty bad ideas. Finally, this process took place several times a year, thus it was not a continuous day-to-day process. In a company with tens of thousands of employees ideas lie everywhere, but finding the best ones has always been a problem only because vetting them has traditionally been a resource intensive task, and thus the numbers reported by AMA are a reflection of management teams not wanting to dedicate the time, effort, and resources to such a task. Idea Management Software is changing the game. Most players in the market, including ourselves (INCENT), have developed effective algorithms and ‘game-like’ situations to help ideas flow at an unprecedented rate into the funnel, reduce the pre-vetting strain on management resources, and ultimately yield a higher number of high quality ideas for management to review. Criteria are usually defined around the company culture and values. For example, Bank of America’s scorecard reflects the following: ease of implementation, associate impact, customer delight, and revenue potential. Once the criteria are applied to the ideas, those with the highest ‘expert’ scoring will likely be introduced to the idea pipeline. Posted on Friday, May 28, 2010 by George R.
Still having doubts about the Toyota Production System’s benefits? Are you able to improve your Business Processes effectively? Yokoten – Finding the holy grail of the Continuous Improvement process. The importance of a 15-minute daily huddle with your team. Stand in the circle and observe. Make sure Continuous Improvement and Innovation are never ending cycles. Say what you do and do what you say!